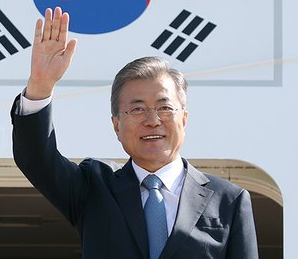 Last week's Cheong Wa Dae reshuffle did little to restore MOON Jae-in's momentum. A few months ago, the President was still enjoying record approval rates (over 80%! ): people felt so relieved after bracing for an imminent military conflict, that everything else seemed trivial. Everybody knew that these peaceful summits with North Korea wouldn't lead to denuclearization, that the economy was on the wrong track, that the air we breathe was not tasting any better, but at least apocalypse had been postponed sine die*. is he being too much played by KIM Jong-un? is he letting ideology too much undermine the economy? is he taking too much liberty with separation of powers? Regarding North Korea, this President does go far beyond the good cop routine. Instead of maintaining a friendly pressure, he seems to be all out pushing KIM Jong-un's agenda: the JSA transformed into a welcome mat? a no fly zone over the DMZ? joint inspection of the Hangang? massive diplomatic efforts in favor of lifting sanctions? If Pope Francis didn't say no to a visit to Pyongyang, Macron, May, and Merkel politely but firmly rejected an Iran deal scenario. At home, the opposition as well as members of MOON's own party were not happy to discover that massive parts of the infrastructure budget had not only remained unspent, but reallocated to a fund for future infrastructure in North Korea, without any notice to the Assembly. A few days later, MOON Jae-in convened party leaders to ask them to get ready for a KIM Jong-un visit to South Korea... What does he expect? The Liberty Korea Party to send cheerleaders along Sejong-daero and throw petals at the dictator's motorcade? Regarding the economy, after months of denial that anything was wrong, the President fired his controversial aide JANG Ha-sung, who kept praising the massive minimum wage hike that totally crippled the nation's dynamics at the worst moment, even after KIM Dong-yeon, the Deputy Prime Minister for the Economy, conceded that the unpopular measure could have played a role in higher unemployment and slower growth. MOON fired KIM at the same time, replacing him with HONG Nam-ki. But to fill JANG's shoes, he picked another controversial figure, KIM Soo-hyun, announcing that the new KIM would have more power than HONG. KIM Soo-hyun later said that he would be a team player, and that HONG was in charge, but the damage was done. A former head of the Seoul Institute, KIM Soo-hyun is not an expert in economics, but specializes in urbanism and environment. His name is associated with disastrous policies that were supposed to curb real estate speculation, but fueled it instead; first under ROH Moo-hyun, then under MOON Jae-in (as senior presidential secretary for social affairs). Both JANG and KIM mean well, and both want to help the little guy, but both end up hurting the little guy even more because both tend to puts ideology first, to neglect impact studies, and to refuse to admit mistakes or to learn from them. Beyond failed castings and policies, MOON Jae-in is criticized for bypassing institutions. The Deputy PM in charge of Economy is not running the show, but coping with the consequences of JANG and KIM's decisions. And these advisors don't have to be confirmed by the Assembly. So far, MOON Jae-in has imposed seven Ministers that haven't been confirmed, and the last one (CHO Myung-rae - Environment) even failed the legislative vetting. If people at the Ministry of Economy are not comfortable with owning the failures of a handful of Cheong Wa Dae advisors, what to say of lawmakers from MOON's ruling Democratic Party? For months, they have begged the President to change policies, if he doesn't want his camp to get shellacked at the 2020 elections. The situation is truly distressing: small businesses are barely surviving, small jobs are suppressed in record numbers, youth unemployment is skyrocketing. For too many, MOON's 'income-led' policy has lead to zero income. And it's only days after growth forecasts have been slashed from 3.1 to 2.7% that we learn that most of the government's investments in infrastructure have been secretly sacrificed for North Korean dreams. If we're by no means talking separation of power breaches or corruption scandals in the PARK Geun-hye-CHOI Soon-sil-WOO Byung-woo vein, there is a crisis at the executive level, and MOON Jae-in must bring more serious changes to dissipate growing doubts. After the minimum wage debacle, the NPS sinking. Cheong Wa Dae ayatollahs just rejected 3 scenarii from finance ministry to save the National Pension, even adding that they didn't mind depleting the fund to give away more today. * knock on wood - Trump may still need a diversion from various probes. The only 'red nose' we want for Christmas is Rudolf's.